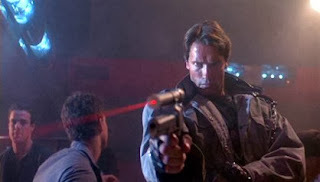 The Terminator is one of the action movies, helping to define the genre, as well as the style people call “80’s”. But it is by no means a stupid movie, or a shallow movie – it’s really very serious. It is not stupid or shallow, but it is also not complex, which is to its credit. After all, every beautiful thing is simple, because every beautiful thing is harmonious and well proportioned, and harmony and proportion lead to unity, and unity is simple. There are several things to discuss in the razor sharp simplicity of The Terminator. There is the sense of mystery conveyed by the story-telling, which reveals only snatches of great and ominous things, or the metaphorical implications of the film -- this whole movie is like a single metaphor: technological progress (a robot from the future) attempts to destroy humanity at its roots (an unborn child). But, what I want to focus on here is the similarity and dichotomy between Kyle Reese and the T-101, and what it is that makes Reese a hero, and the Terminator a monster (besides the obvious). The Terminator is relentless. It is totally dedicated to its mission. Even self-preservation is secondary to its goal. Yet, this is also true of Kyle Reese. Really, it has to be. If Kyle cannot match, step by step, the dedication of the T-101, he cannot hope to succeed in protecting the woman and child that Skynet seeks to destroy. This total dedication is an admirable quality that both Kyle and the T-101 possess. But for the Terminator, it isn’t a personal quality. It is a practical feature. It is relentless like my toaster is relentless. The reliability of my toaster pleases me, because I can have toast. But Kyle’s dedication is of a whole different order. His is the result of will, discipline, and desire. It is like a miracle; something beyond the mere process of cause and effect. He is not a machine. The Terminator is barely stoppable simply because he is built to be; unconscious of pain, made of steel. Kyle is barely stoppable because he wills to be, because his spirit is strong even though his flesh is weak. The scars that cover Kyle’s body and his cries of pain throughout the film are badges of honor because they are signs of weakness in spite of which Kyle soldiers on. He has far more to overcome than the T-101, and yet he matches it move for move. This dynamic is played out all through the movie’s action sequences until eventually the terminator is destroyed, but Kyle is also killed. They both strive to the utmost of their capacity, and all their strength is spent. And yet Kyle wins, and the terminator loses. This, of course, has something to do with Sarah Conner, who strikes the final blow after Kyle has made it possible. Her character is the topic of part 2. Your comparison of Kyle to the Terminator is telling -- I had never thought to compare the two.